Different people have different traditions, so my Aloha Friday question is: What foods do you like eating during the holiday season? What foods do you like making during the holiday season? Oh of course it’s Latkes. We always look forward to them on the first day of Chanukah. for the Christmas season I guess it would special cookies. I’m featuring them on my Kitchen site, one each day. Since I’m of polish heritage…I love to make and eat kielbasi and saurkraut, perogis and Polish type bakery. mmmmm. Happy Chanukah! .-= sheila´s last blog ..Aloha Friday Annoying friends. =-. Seems like now that my kids are older, we no longer eat the items mentioned in the last two comments (minus the sauerkraut). And, since we are in mourning right now, I guess I’ll just stick to the every day stuff and not venture into the holiday treats. .-= Harriet´s last blog ..I love December Stuff- updated 12/4 =-. well not much right now my twinkies are little and it’s hard to get anything baked!We are having a Christmas dinner with a turkey ! !Happy Hanukah! .-= Olga´s last blog ..AloHa FriDaY!!! =-. .-= TheAngelForever´s last blog ..Potty talk from the Diaper Kid =-. My kids insist that we have those miniature size boxes of cereal on Christmas morning. I’m not sure when that became a tradition, but apparently it did. And New Years eve we always ahve the same dips, cracker and etc, with very few variations. I like roasted pork, rice with peas and pasteles. 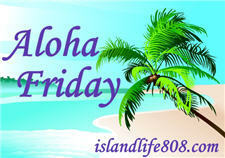 .-= Annie´s last blog ..Aloha Friday!!!!!!!! =-. I love making ham, cheesy crockpot potatoes, different cookies, cakes, breads that I normally wouldn’t make. I’m famous for making my Chocolate Trifle during the holidays. Yum! .-= kailani´s last blog ..Arm & Hammer SpinBrush Toothbrushes for Kids =-.